Ultra Low Res was commissioned by Phipps Conservatory and Botanical Gardens to design and build an interactive work for their Gardens of Sound and Motion show. Detail of aluminum interaction pods. 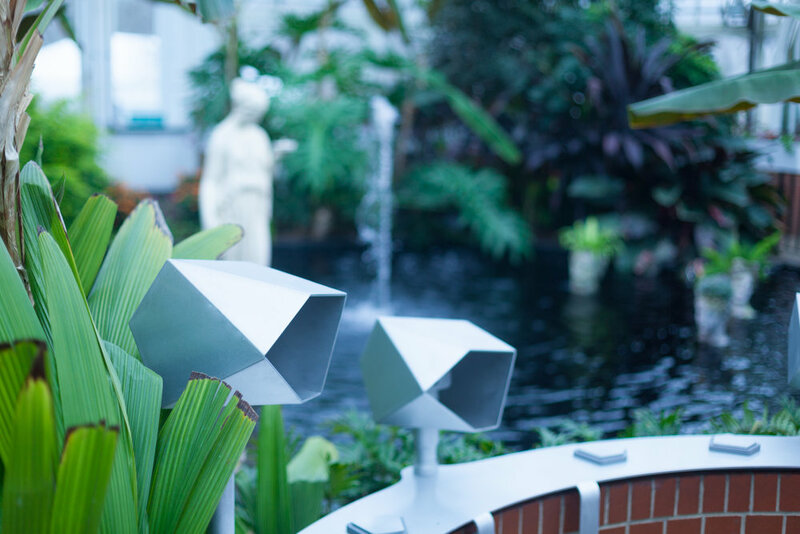 Situated alongside the indoor Victoria Room Pond, the Fountain Composer consists of several capacitive touch-sensors integrated into an aluminum control station, designed specifically for the space and detailed and fabricated by Standard & Custom. Adult visitors enjoy exploring the piece just as much as children. As visitors enter the room, they're engulfed in an ambient soundscape and immediately confronted with the Fountain Composer. Signage directs them to explore the piece by touching any of the 12 aluminum pads. When one or more pads are touched, a corresponding fountain springs to life from the pond and a deep bell-like tone rings out and fades back into the soundscape. The entire experience is a disorienting mix of calming sound composition and kinetic surprises.